Daily Mirror - Obama calls treatment of Vietnam War veterans "a disgrace"
Obama calls treatment of Vietnam War veterans "a disgrace"
President Barack Obama called the treatment decades ago of returning Vietnam War veterans a "national shame" on Monday and promised as commander-in-chief not to send U.S. troops back into harm's way without a clear mission and strategy. Obama did not mention rising tensions with Iran and Syria or other potential threats in his remarks to veterans and military families on a hot, sunny Memorial Day, focusing instead on the legacy of Vietnam and his own efforts to wind down the Iraq and Afghanistan wars started by his predecessor, George W. Bush. "You were often blamed for a war you didn't start, when you should have been commended for serving your country with valor," Obama told a crowd gathered at the Vietnam Veterans Memorial Wall, which lists names of those who died in the conflict. "You came home and sometimes were denigrated, when you should have been celebrated. It was a national shame, a disgrace that should have never happened. And that's why here today we resolve that it will not happen again," he said to applause. The president noted that many Vietnam War veterans have gone to airports to personally greet soldiers returning from Iraq and Afghanistan, many of whom joined the military in response to the September 11, 2001, attacks that triggered the now-unpopular wars. "Across America, communities have welcomed home our forces from Iraq, and when our troops return from Afghanistan, America will give this entire 9/11 generation the welcome home they deserve. That happened in part because of you," he said. Obama asked all of the veterans in the crowd to rise to be recognized. "Welcome home. Welcome home. Welcome home," he said. Veterans and family members wiped tears and sweat from their faces during the ceremony, which ended with a fly-over by Vietnam-era aircraft including a B-52 bomber. John Hoffmann, 67, of Springfield, Virginia, served a year in Vietnam from 1970-1971. In a conversation with a reporter, he stopped abruptly to salute when the U.S. national anthem was played. "We virtually came back to a thankless country," he said, his voice breaking. "So I'm ... grateful for this day that we get the recognition that we duly deserved so many years ago." 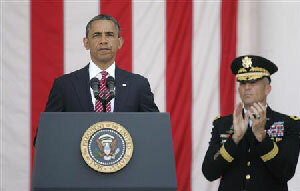 Obama's 2008 election campaign centered on his promise to end the wars in Iraq and Afghanistan and as president he has focused heavily on improving the care and welfare of veterans, including those suffering from post-traumatic stress and other disorders that were undiagnosed at the time of the Vietnam War. Without speaking explicitly about the Bush era, when critics said U.S. troops were sent into conflict ill-equipped and with unclear goals, Obama attributed many of the initiatives he has put into place to "the true legacy of Vietnam." "Because of the hard lessons of Vietnam, because of you, America is stronger than before," he said. "When America sends our sons and daughters into harm's way, we will always give them a clear mission, we will always give them a sound strategy, we will give them the equipment they need to get the job done," he said. "We will resolve that leaders will be candid about the risks and about progress, and have a plan to bring our troops home with honor," Obama said. Earlier on Monday, at the Arlington National Cemetery, Obama described "the light of a new day on the horizon" with overseas conflicts abating. He drew applause when he noted it was the first Memorial Day in nine years without Americans fighting and dying in Iraq. "As commander in chief, I can tell you that sending our troops into harm's way is the most wrenching decision that I have to make," Obama said shortly after laying a wreath at the Tomb of the Unknown Soldier. "I can promise you I will never do so unless it's absolutely necessary, and that when we do, we must give our troops a clear mission and the full support of a grateful nation."